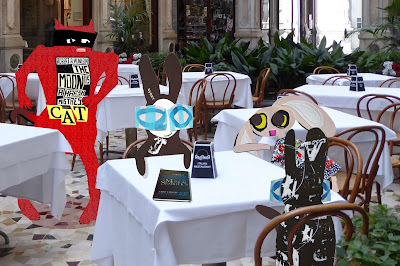 The Wabbit threw a book on the table. "I found it." Lapinette was agog. "It's practically unobtainable." Skratch the Cat bore down on the group flaunting his new t-shirt, but he spotted the book and let out a long haunting meaow. "Where? How?" The Wabbit grinned and shook his head. "That, I may not reveal. But it's yours now." "A Theory of Musical Semiotics," he chortled; "I'll quote that for years." A fresh breeze ruffled the pages. A faint tune rose and died away. Lapinette took the opportunity to ask the question. "What kind of adventure are we having?" Skratch blinked in a way that only a cat could achieve. "I wouldn't dare criticise a project in progress." "That's Sartre," said Lapinette. 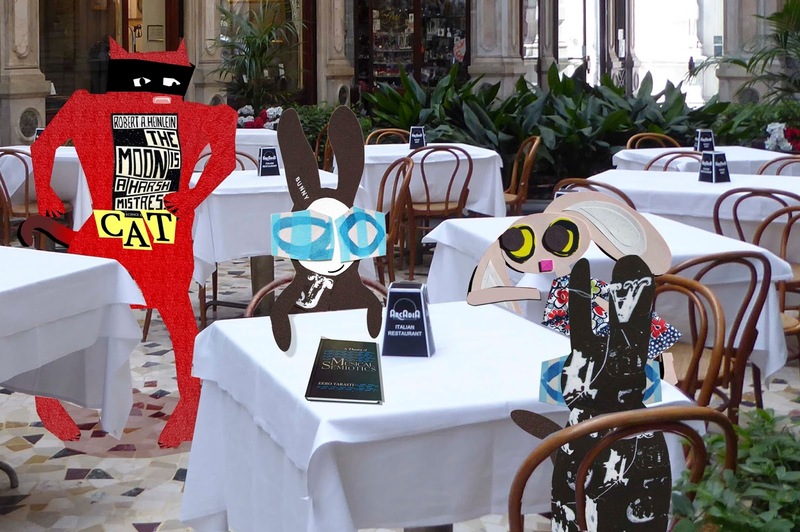 The Wabbit tapped the table with a firm paw. "Less methodology, more entertainment." Skratch tapped his chest. "I suggest water is invariably the site of conflict. In cinema, it mobilises a dramatic and conflicted discourse as fluid and changing as water itself." It was Wabsworth's turn to contribute." "This is about the content of water, not its shape. It's somethingness is the issue." The arcade was hot. A welcome breeze brought a change in temperature, prompting Skratch to sweep his paws across his ears. "Something in the air. Something strange." The Wabbit rose. "Time to rock n'roll..."